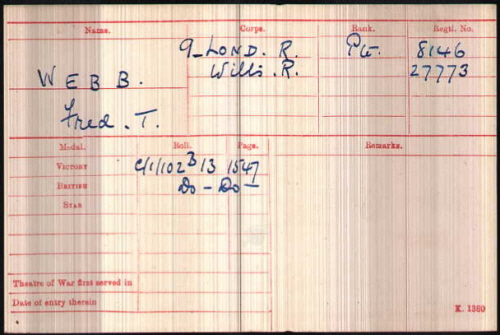 Fred Tilbrook Webb was born in Great Thurlow (Risbridge Q4-1882 4A:555), baptised in All Saints, Little Bradley on 11th February 1883, son of Samuel and Catherine WEBB (née TILBROOK). 1891 census...Aged 8, he was at Thurlow Road, Great Bradley with his father Samuel WEBB  a builder born in Clare; his mother Catherine  born in Little Thurlow, sisters Frances Alice  and Ethel  and brother Cecil , all born in Great Bradley. 1901 census...Aged 18, a butcher, he was boarding with butcher Urban Arthur BROWN and his family at 9 Queens Street, Haverhill. His parents were in Great Thurlow with his sisters Frances, Ethel and Elizabeth  born Gt Bradley; brothers Cecil, Edwin  and Wilfred , the last two being born in Great Thurlow. 1911 census...Fred had not been found in this census. At The Manse in Thurlow were his parents, sisters Frances and Elizabeth; brothers Cecil (bricklayer), Edwin (butcher's boy) and Wilfred (school). All 7 siblings survive. He is unlikely to have been in the Army as if so he would have been mobilised much earlier. His address for probate was 222 Uxbridge Road, Shepherds Bush, Middlesex. He does not appear to have married, as probate, in the sum of £608-9s-5p, was granted to his Father Samuel. 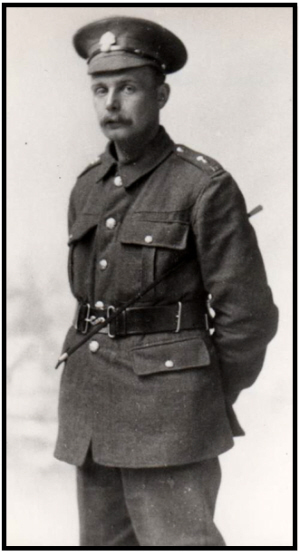 Fred enlisted in Hammersmith, London and stated that he lived in Great Thurlow. The war diary has the battalion were in trenches to the east of the Messines-Wytschaete ridge, their right on the WAMBEKE and the left on JUNCTION BUILDINGS. "A" and "B" Coys in the front and "C" and "D" in reserve 2,000 yards behind. At 3:30 am heavy shelling began, HE and gas. The gas ceased at 5:30 and the HE climaxed at around 6 am when the Germans under cover of mist attacked the 57th Brigade on the right and forced its centre back to its reserve line. This left the 10th Warwicks having their right flank turned, forcing some to falling back to the right flank of the Wiltshires. The WAMBEKE formed a natural boundary between the 57th and 58th Brigades and just north of it ran a long duck boarded trench (MANCHESTER ST). 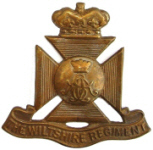 Between VERNE ROAD and GUN FARM was a system of flooded shallow trenches which the Wiltshire "C" Coy quickly occupied to form a defensive position, whilst half of the supply platoon of "B" Coy plus any parties of the Warwicks who got across the BEKE manned MANCHESTER STREET as along defensive flank. The whole sub sector was subjected to intensive shelling and much MG and rife fire from the high ground around ANZAC FARM. The position was held everywhere until 4:30 pm. At around 3:30it was seen that the enemy were massing 2,000 yards east of our front line but although a frontal attack developed it got nowhere due to our vigorous Lewis gun and rifle fire. At 4:30 pm the Bn on the the left (9th RWF) were ordered to evacuate the front line, and as the order had emanated from Brigade the front line was also abandoned by our Bn. A strong position was then taken up by our leading Coys. The enemy advanced again, up to our original front line but got no closer than 600-800 yards. About 6 pm the enemy organised strong attacks on our right and left flanks - the order to withdraw on to the reserve line never reached the front line Coys so our positions on the support line were held until the enemy had completely surround the two front line Coys, only a few managing to work through to our lines. The Reserve Coys, which had been heavily engaged on the right flank, fell back fighting on to the high ground west of OOSTAVERNE. Battalion HQ Coy was used in an attempt to strengthen the right rear and was also heavily engaged in the fighting,losing the CO Major Monreal. Through the night survivors rallied on portions of the front between the DAMMSTRASSE and WJYTSCHAETE. 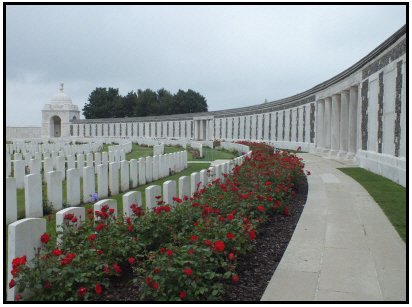 CWGC records 42 of the 6th Wiltshires killed on 10th, none has an identified gave, all are named on the Tyne Cot memorial.